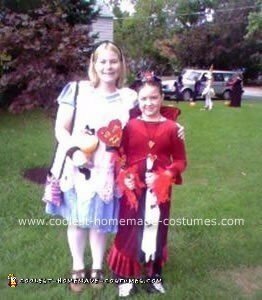 My daughter and I love Alice in Wonderland so we decided to create homemade Alice and the Queen of hearts costumes. She even carried a scepter that was huge and said “off with your head”. My dress had actual cards all along the bottom. It was a fun year. I was a peacock another year and my daughter was a Smurf and Velma from Scooby Doo other years, boy those were fun too. I’ll try to get the pics and post those too. We never buy our costumes store bought, too much fun to make em ourselves. I especially love adding all of the extra little touches like me carrying a Cheshire cat for example. 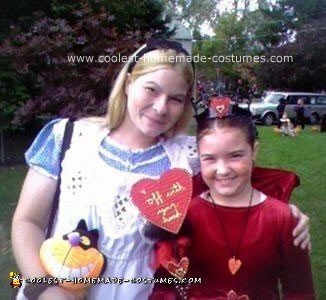 We make our costumes every year. I even am making a friend of mine’s little boy into a yo yo this year. Whoa, that’ll really be a doozy. I take pride in taking my time and being that mom that the kiddos all know will make something awesome for them in the end. My daughter’s outfit was all hands sewn for the queen and mine was a child’s apron cut and I added cards all around the bottom. The pictures do not do this justice, we looked hilarious. I recently redid the kitchen in our cottage to an Alice theme (just for fun) and we were able to use many parts of our costumes in there… Great memories.